Fortunately, the problem has now been solved with the help of SIG Design and Technology, which specified its SIGnature Torch on System to remediate the leaking roofs once and for all. By avoiding complete stripping of the failed roofs, this strategy provided significant cost savings. However SIG managed to find an economical solution for the 250 sqm pitched oval roofs, which enabled the contractor to leave the original single ply roof in situ beneath the overlay rather than stripping and disposing of it, saving an estimated £60+ per metre. SIG worked with DATAC accredited contractor Roofix Ltd to install the SIGnature system as an overlay. To address the issue of potential plasticizer migration between the old and new roofs, a 300g separation fleece was fitted on the original roof followed by a mechanically fixed SIGnature25 underlay and a fully-torch bonded layer of underlay and cap sheet. The second, crucial phase of the work was the correct detailing of the junctions with the flat roof and the upstands around the roof perimeter. Roofix Ltd found a way to close mitre cut and bend the GRP trim in situ to fully encapsulate the upstand as an alternative to the original failed metal capping. “Good tradespeople come up with good solutions,” says Ian Dryden, who praised the time and care that went into the detailing. Thanks to the craftsmanship of the contractor, the repairs were completed over the summer holidays in an aesthetically pleasing manner that came in under budget and – importantly – fully warranteed. “This ticked all the boxes from the client and the local authority’s points of view,” says Dryden. The proof has been 18 leak-free months since the repairs. Designed for new work or overlays, this bituminous roofing system comprises fire rated torch-on cap sheet, underlay and vapour control layer and is suitable for warm or cold roofs. SIGnature Underlay25 – polyester carrier, reinforced, SBS, torch applied intermediate or base layer. Twenty five year warranty when used with the SIGnature Fire Rated Cap Sheet. SIGnature Underlay20 – A glass tissue carrier, reinforced, SBS, torch applied intermediate or base layer. Twenty year warranty when used with the SIGnature Fire Rated Cap Sheet. SIGnature UnderlaySA (Self Adhesive) – An elastomeric self-adhesive, polyester fabric reinforced underlay, coated with SBS modified bitumen. Twenty five year warranty when used with the SIGnature Fire Rated Cap Sheet. Consult a waterproofing specialist as early as possible during the design stage. Specify a roofing system that is fire-rated and CE marked. 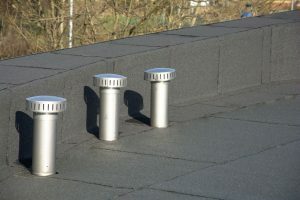 We can provide independent advice on the best system for your roof. Ensure design details and execution are undertaken by a company that is competent, experienced with a proven track record and are covered by PI insurance. Make sure all the products and the installation are covered by warranty. 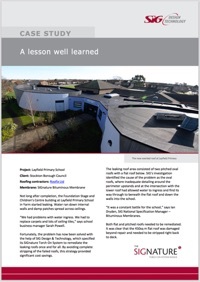 If you have a problem with a leaking school roof, find out how we can help here.